If you aren’t careful, you can sink a lot of money into fishing rods and reels. Generally, the best fishing rods are expensive commodities that you can only purchase if you have deep pockets. We took a look at the best models for spinning and baitcasting as well as the best fly fishing rods. They are two different worlds, but we wanted to provide a reasonable example of the best fishing rod you can buy, and an inexpensive alternative that can work if you are just getting into the sport. Casting away your first inexpensive fiberglass spincasting rod and stepping up to a quality fishing instrument makes a huge difference in the quality of your fishing. If you have your technique down, a higher quality graphite will help you feel the water and lure action much better than fiberglass. It is an investment, and one that can be as expensive or as affordable as you want it to be. The same principle goes for fly fishing rods. Many inexpensive fly rods are stiff and obnoxiously fast. They have no feel and there is no “groove” to using them. It’s either all out or nothing. Quality graphite or composite fly rods can provide a smoother, more precise and comfortable experience. Check out our list below of the best models currently available. The St. Croix Legend Extreme Series is our top pick in this category. For 65 years, St. Croix has been making some of the top rods you can own. These American-made rods are crafted in Park Falls, Wisconsin. Designed to be balanced, light, exceptional durable and stylish, the Legend Extreme series has everything you need and more. Packing in full-features and a relatively affordable price (compared to most high end fishing rods), the Legend Extreme series has earned a vaulted reputation as the best bass fishing rod. St. Croix offers a spinning model and a baitcasting model. Any of the rods in the Legend Extreme lineup deliver superior form and sensitivity. The rods become an extension of you, picking up on the smallest of vibrations and movements. Advanced high-modulus graphite is the key to the Legend Extreme’s sensitivity. It’s really hard to find quality graphite rods at this price range. St. Croix uses a technique they call Taper Enhancement Technology to construct the rod. Sheets of graphite fabric are cut and applied in a curved pattern to ease the transition between different stiffness areas along the shaft. The amount of strength and sensitivity gained from this process is admittedly marginal, but that is what makes the difference in the best fishing rod brands. The St. Croix Legend Extreme is one of the most comfortable rods available too. The handle looks strange at first glance. It’s covered with a synthetic fabric that is light and functional. The grip gets quite narrow, but swells to the front and rear creating an hourglass shape. Ergonomically, the grip feels excellent. Moreover, the hourglass taper helps improve sensitivity to keep you in tune with your fishing. If you are in the market for a new fishing rod and you’re looking for the best, you have to check out the Legend Extreme. St. Croix makes no compromises despite the relatively low price. If you’re just getting into fishing or you don’t have the money to buy a top-of-the-line professional series fishing rod, the Okuma Celilo Graphite is a good compromise. The graphite construction delivers performance that references the feel of the more expensive St. Croix Legend Extreme. The rods definitely do not feel exactly the same, but the durability and sensitivity of the graphite is close enough that most beginning fishermen won’t notice the difference. If you’ve never used a really expensive rod before, then you won’t be missing anything. Overall, the Celilo is well prepared to handle almost any freshwater fishing situation. For the money, it’s the best fishing rod for someone who needs functionality, the feel and sensitivity of graphite, and a go-anywhere package that is inexpensive. Beyond that, it’s the perfect “stepping stone” fishing rod for a beginner fishermen who is starting to experience the advantages of a quality rod. The Sage Fly Rod is different from most of the fly rods currently available. Instead of focusing on speed and stiffness, this rod is designed for slow to moderate action. It’s the perfect all-around trout fishing rod. The expensive price is completely justified. You forget about the price as soon as you feel the rod working a stream in your hands. The high quality construction keeps the weight very low and the rod delicately responsive. Precision is completely unmatched and the utility of this brand is unbeatable. It handles a variety of combinations and rigs and always goes where you point it. While expensive, it is exactly what you would expect to get from one of the best fishing rods. The above-mentioned Sage rod is too expensive for most fishermen, especially if you are just getting into fly fishing. If you get a chance to try a rod like the Sage out, you’ll immediately notice that it has a particular “feel” to it. It’s a moderate action rod that isn’t too fast. Every fly fishing rod is going to have a different speed and casting profile. Some of the best fly fishing rods are those that don’t move with an action that’s too quick. 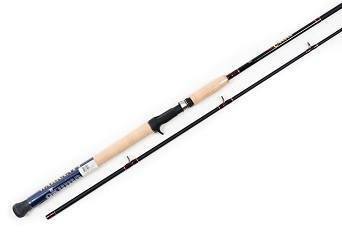 The St. Croix Rio Santo is one of those rods, and a good “budget” alternative to much more expensive models. The rod itself is made of SCII graphite with a Flex Coat slow-cure finish. These rods are less expensive than the American-made St. Croix models. They are designed in the United States and assembled in Mexico. Don’t let that fool you. The components are still top-notch and the feel is superb. Because of its versatility and low cost, the Rio Santo is a common alternative to the most expensive fly rods. But yet it is still one that you will find many advanced fishermen using. If you’re just getting into fly fishing and you want to do it right then this is a great choice. When just starting out in the world of fishing as a young angler, the right gear can greatly increase a child’s success. Ensuring that your child is outfitted with the proper equipment not only allows for their first fishing experiences to be fun, but also safe and productive. 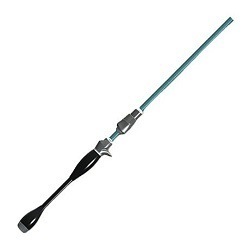 If you really want to ensure that your child has a no-headache first time fishing experience, then buying the Kid Casters No Tangle Fishing Rod is the way to go. Nothing is more frustrating, even for the experience angler, than a line that gets tangled up. Kid Casters has eliminated this annoyance by running the line through the center of the shaft in order to provide hours of hassle-free fishing for your child. Due to the no-tangle construction, this rod is made from hollow fiberglass, so it does run the risk of breaking easily if you leave it on the ground where it might get trampled on. Therefore if this no-tangle feature appeals to you, then be sure to keep the rod in a safe place when it’s not in use. Another good feature is that it comes with a safe plastic hook and a training lure to guarantee that small fingers are kept safe. The rod is fully usable for catching real fish but offers a safe and easy option for young children. Affordably priced, Kid Casters offers a hassle-free solution for teaching your kids how to fish.